The Guwahati Station traces its origin to the Shillong Guwahati Station of All India Radio. During those days Shillong was the administrative capital of undivided Assam. The Guwahati Station started its service from the beautiful Commissioners Bungalow located on the bank of the Brahmaputra at Uzanbazar Ghat. The then Premier of Assam Shri Gopinath Bordoloi had allocated the Bidhan Sabha Bhawan at Shillong and the Commissioner Bungalow at Guwahati for setting up the Shillong Guwahati Station temporarily. From the middle of April 1948, Programme Executive Late U.L.Barua (later Director General of All India Radio) and staff artiste Late Purushottam Das of the Calcutta Station had started working in Shillong and Guwahati respectively. To facilitate the inauguration of the station on the 1st of July 1948, Dr. Bhupen Hazarika , Late Phani Talukdar and Late Birendra Kumar Phukan were given temporary appointment on 1st of June 1948 as Programme Assistant. Late Mehera Masani was the first Station Director of the Station. She along with the team mentioned above, did all the preliminary work and the Shillong Guwahati Station of All India Radio started its broadcast from the 1st of July 1948. The formal inauguration of Studios was done by the Premier Gopinath Bordoloi in Shillong and Maulana Mohmad Tayabullah in Guwahati. Post inauguration regular interview was conducted and along with Dr.Bhupan Hazarika, Phani Talukdar and Birendra Kumar Phukan, Satyaprasad Barua, Syed Abdul Malik, Rosonara Khatun, Narayan Bezbarua, Ranjan Bora and Mrigendra Nath Roychoudhury were given regular appointment at the station. In the beginning the Station had two transmissions daily. The morning transmission was of one and the half hour duration with programmes commencing from 7.00 am and continuing up to 8.30 am. The evening transmission was from 5.00 pm to 9.15 pm for duration of 4 hours 15 minutes. Initially the station was broadcasting its programme from two studios one in Shillong and one in Guwahati through a 1 KW MW Transmitter. Both, the Shillong Studio and the Guwahati Studio were headed by an Assistant Station Director each. 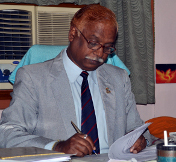 The Station Director who sat at Shillong was the overall head of the Shillong Guwahati Station. The two units were connected by a telephone line. In 1953 the power of the station was increased with the installation of a 10 KW MW Transmitter at Jalukbari. As a result the station was able to increase its coverage area to Kamrup, Nagaon and other nearby districts. Popular programmes of today like ‘Goya Raijor Anusthan’ (Rural Programme), ‘Aideur Buloni’ (Women’s Programme) and ‘Akonir Mel’ (Children’s Programme) traces their origin to those early days of broadcasting. Two other popular programme, in those early days of broadcasting, were the ‘Weekly Radio Drama’ programme and the fortnightly’ Musical Feature’ programme. The first musical feature programme broadcast by the station was the Musical Feature ‘Asomiya Maat’ by Dr. Bhupen Hazarika. In 1953 The Headquarter of the Shillong-Guwahati Station was shifted from Shillong to Guwahati. The month of May in 1957 the station shifted to its permanent campus at Chandmari. In 1958 the power of the station was augmented by the commissioning of a 10 KW SW Transmitter. As a result the Guwahati station’s broadcast could now reach the whole of Assam. From its inception as the Shillong-Guwahati station of All India Radio on the 1st July 1948, the Guwahati station of AIR is presently a full-fledged Regional Station with 3 channels of broadcast. While the Guwahati A & B Channels are AM Channels the CBS Channel is a FM Channel. After four decades of monopoly in the field of mass communication in the state, in recent times it faced stiff challenges from T.V. and a multitude of print media. However the station has stood up to these challenges and in spite of the impact of the audio-visual media amongst the people AIR Guwahati has been able to retain a wide listener base among the populace.